JANUARY 2019 passed by with little of interest on the railway front in the County and what there was being unwelcome. First bad news wass that of a huge demand for extra rent from the owner of Lady Foley's Tea Room on Great Malvern Station. It seemed that the operator of the station was really seeking to close the cafe and thus reduce its income from rent to nil. Then it was revealed that the new Worcestershire Parkway Station would not be operating until the end of 2019 at the earliest. 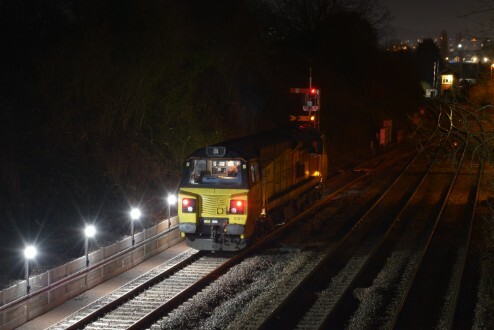 The new turnback siding created in 2018 finally saw its first train when Colas livery class 70 diesel locomitive No.70811 was sent from Hinksey to test out the arrangements. Robert Pritchard was there when the first locomotive arrived on Monday 11th February 2019.